Uedama is a favorite location for ganking freighters in part because it's a 0.5 security system. Perhaps recognizing this, LINKIN HY did his best to stick to safer systems, such as Iyen-Oursta, which boasts a stifling 0.8 security status. What he didn't count on was a massive fleet from the mighty CODE. alliance. Agents Australian Excellence, Giselle Rozei, Tax Collector Max, Taxman Daniel, Joshua Kusion, Johnathan Kusion, Tax Collector Stroheim, Tax Collector Hill, Tawny Rozei, Tax Collector KarlMarx, Christine Rozei, Sherri Rozei, Tax Collector BokChoy, Tax Collector Aruka, Tax Collector Richard, Tax Collector Kittens, Pod Destroyer Molly, Jayson Kusion, Justin Kusion, Joseph Kusion, Jake Kusion, Joel Kusion, Jackson Kusion, Jayden Kusion, Jeremiah Kusion, Ruby Rozei, Jason Kusion, Shanade Rozei, Katy Rozei, Lagatha Rozei, Tax Collector HongMei, Trump The King, HSM MasterChief, Harletta Quinn, and Lobo El Lobo brought in dozens of stealth bombers and took the 28 billion isk jump freighter apart. 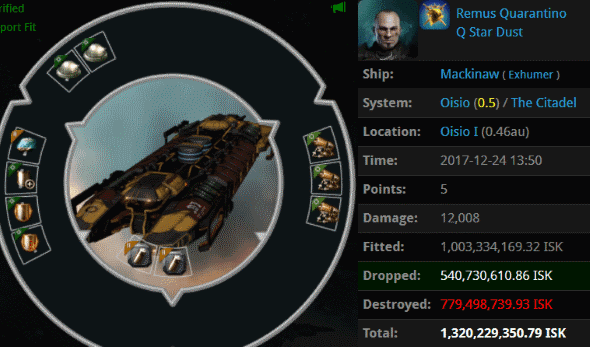 Interestingly, another 22.5 billion isk jump freighter in the same system, also equipped with a rack of ORE cargo expanders, was killed that same day. Was there some sinister plot at work? ...Maybe so, because Gina Lin also lost a triple-ORE jump freighter in the same system. Same day, too. 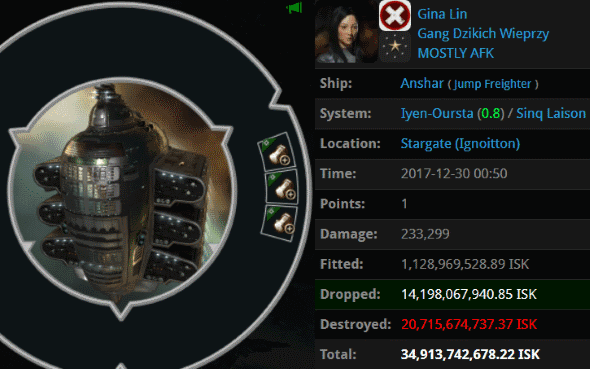 Gina's monster was even more expensive, weighing in at nearly 35 billion isk! Agents Jason Kusion, Trump The King, Pod Destroyer Molly, Tax Collector KarlMarx, Jayden Kusion, Joel Kusion, Tax Collector Max, Justin Kusion, Jake Kusion, Tawny Rozei, Tax Collector HongMei, Taxman Daniel, Tax Collector BokChoy, Tax Collector Hill, Sherri Rozei, Tax Collector Stroheim, Tax Collector Aruka, Christine Rozei, Tax Collector Richard, Tax Collector Kittens, Jackson Kusion, Joseph Kusion, Shanade Rozei, Jeremiah Kusion, Johnathan Kusion, Giselle Rozei, Joshua Kusion, Ruby Rozei, Jayson Kusion, Katy Rozei, Lagatha Rozei, Australian Excellence, Tax Collector Getwrekts0n, Lobo El Lobo, and Harletta Quinn proved yet again that no system in highsec is safe for a Code violator. Blingy exhumers are a thing of the past, but don't tell that to Remus Quarantino. Actually, do. He needs to hear it. Agents Maximus Gooseman, Edmund Sublett, and Salah ad-Din al-Jawahiri reduced the miner's 1.3 billion isk Mackinaw to stardust. Remember Haze Tveskoeg? He's one of Nakugard's uppity miners. He eventually decided to start mining in a Skiff, not so much out of deference to the Code, but because he thought it would make him immune. It didn't. 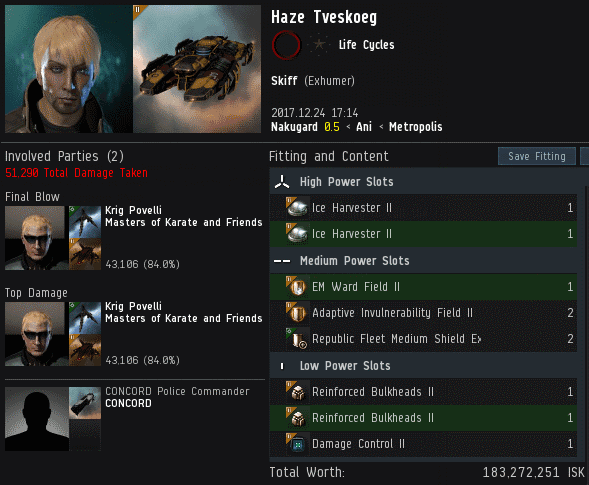 Haze was defeated in elite PvP by Agent Krig Povelli. CONCORD also intervened in the battle, not that Krig needed the help. In the wake of his stunning defeat, Haze found himself at a crossroads. Instead of crying any further, Haze chose a different path. Maybe there's hope for Haze. We'll see. How decadent can a battleship get? Jotkin Hekki injected nearly 6 billion isk into this manifestation of his hubris. Look at that blingy capacitor tank. Agents Jayson Kusion, Jeremiah Kusion, Justin Kusion, Jake Kusion, Johnathan Kusion, Jason Kusion, Jayden Kusion, Joseph Kusion, Jackson Kusion, and Joel Kusion were on the case. They never leave Uedama unguarded for too long. 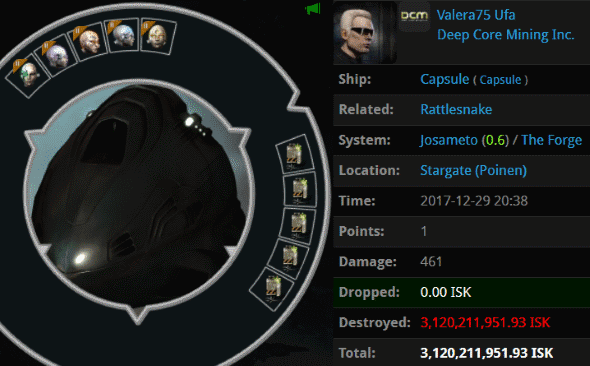 Valera75 Ufa managed to disgrace himself in a battleship, too: He lost a 2.3 billion isk Rattlesnake and then Agent Tax Collector HongMei popped the bot-aspirant's 3.1 billion isk pod. What a memorable day that must've been for Valera75. Whoever sells all these expensive implants must love the New Order. 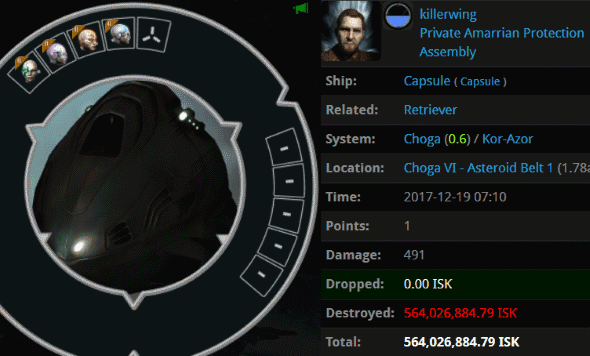 Apo123 purchased 3,150 more shares, which brought us comfortably beyond the 1,565, 1,566, and 1,567 billion isk marks and earned him a Triple Supreme Protector's Tip of the Hat™. Perhaps inspired by other ambitious shareholders, Apo123 is working his way up the ranks. Something to think about. Grand Moff Tarkin1's suggestion might save a few lives this year--another victory for our Agents. No doubt the Anti-Gankers will feel compelled to come out in favor of drinking and driving because of this. What a bunch of Goofuses. The mighty CODE. alliance has a fearsome reputation, which has spread across the entire galaxy. 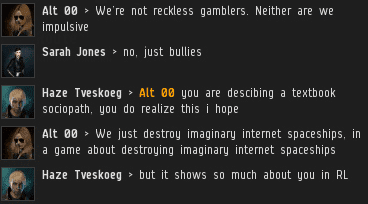 And few Agents are as notorious as Aaaarrgg, the "Wolf of Highsec". 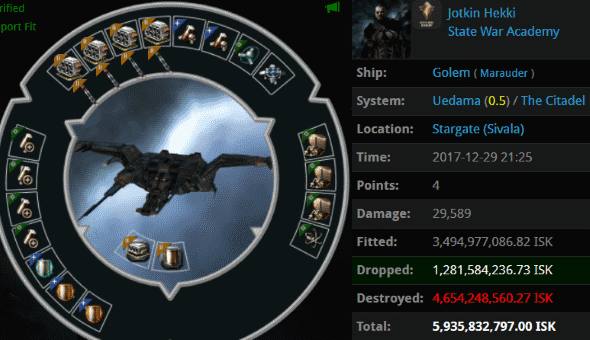 Aaaarrgg has over 11,000 pod kills to his name. 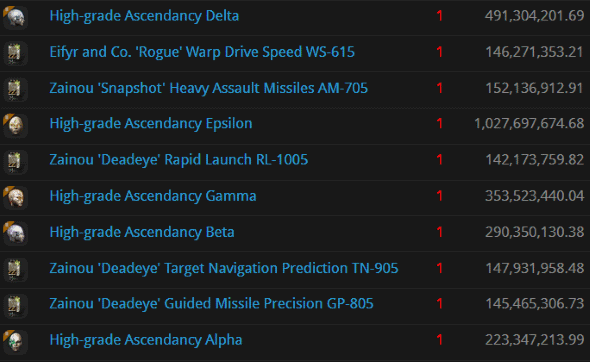 In theory, pods are uncatchable in highsec. However, theories rarely take into account the full wretchedness of bot-aspirant carebears. Shadea Kavees lodged a stiffly worded complaint after her insta-warping pod managed to get ganked in highsec. She was confident that someone else was to blame for her loss. Shadea denied the charge of being a highsec miner. The budding space lawyer decided that her non-miner status entitled her to full reimbursement of her loss. I've heard of reimbursement fraud, but this one takes the cake. What happened to space lawyer ethics? Our Agent grew suspicious of the carebear. Shadea felt awfully comfortable autopiloting through highsec for someone who supposedly wasn't from around here. 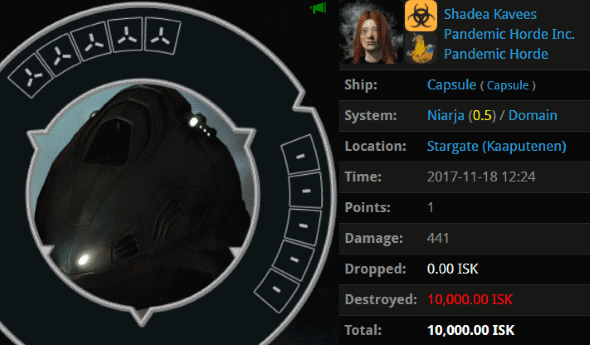 Shadea talked about being from nullsec a little too often. In fact, she wouldn't shut up about it. It raised doubts about Shadea's authenticity. She couldn't be a true nullsec dweller. Sure enough, she was a member of Pandemic Horde. And at the time, she'd been a member for four days. 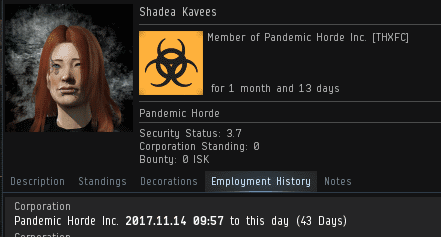 You don't get any more nullsec than Shadea Kavees. Shadea lashed out at Aaaarrgg for pointing out the obvious. She didn't know how to change her clone location, so the carebear was forced to travel all the way back from highsec every time she got killed. No wonder she was in such a bad mood. Agent Aaaarrgg has seen a lot of foolish carebears, but Shadea was an all-time Goofus. 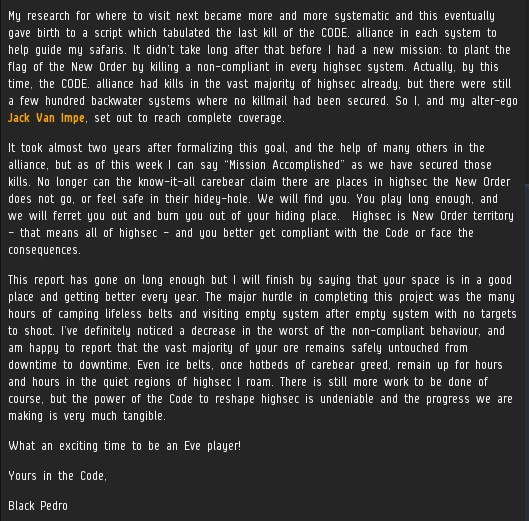 On the plus side, Shadea confirmed that New Order territory is better patrolled than nullsec. The Pride of Nullsec warned Aaaarrgg not to visit her neck of the woods. It was no empty threat--she might snuggle him to death. When miners get ganked in highsec, they typically receive a form EVEmail. 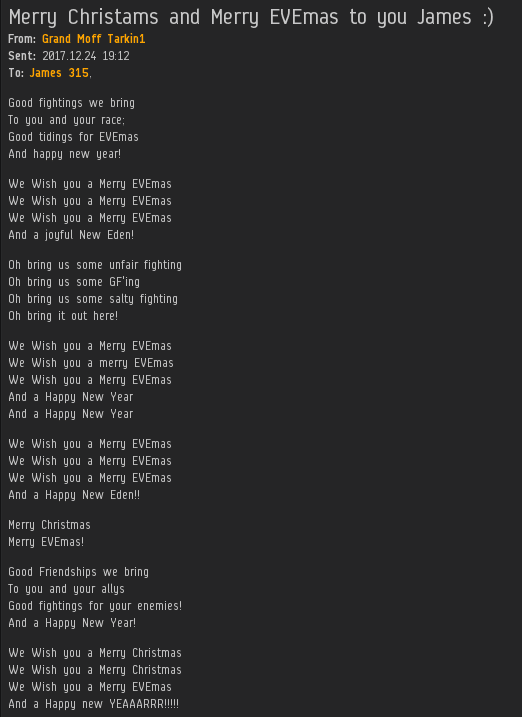 On occasion, the EVEmail is customized. In this case, Tophination received a special termination notice "for a Fancy Venture Pilot". He certainly was fancy. 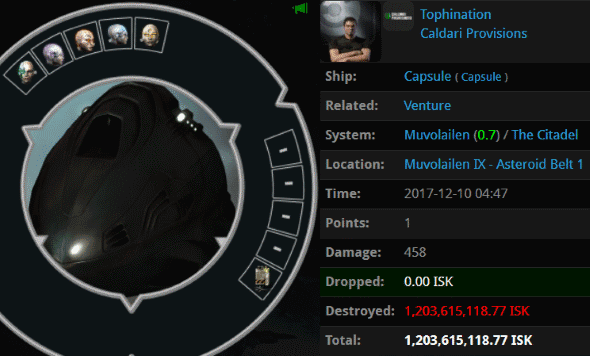 Despite flying a Venture, Tophination had 1.2 billion isk worth of implants--at least until Agent Lawrence Lawton removed them. 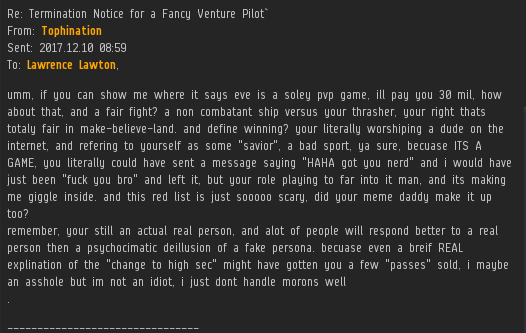 One might expect a Venture pilot to play the helpless newbro card, but instead, Tophination tried to pull rank. The nerve! Lawrence didn't waste time in explaining that Tophination had it all wrong. Agents of the New Order outrank highsec miners. I mean, basically everyone does. Tophination wasn't lying about one thing, though: His character was a bit on the older side. He'd been playing since 2009 and hadn't advanced beyond mining highsec ore with a mining frigate. Clearly he had this game figured out. The miner sent a reply to Agent Lawrence, opening with a heresy so vile as to take one's breath away. And he was only getting warmed up. There was nothing surprising about the fact that Tophination went into an angry rant after being instructed to obey the Code. But that heresy... Lawrence had to say something. Our hero was righteously indignant. You know an Agent of the New Order means business when he breaks out italics for emphasis. The miner continued to drip with bitterness and sarcasm. But what caught Agent Lawrence's attention was the wager that Tophination offered at the beginning of his EVEmail. 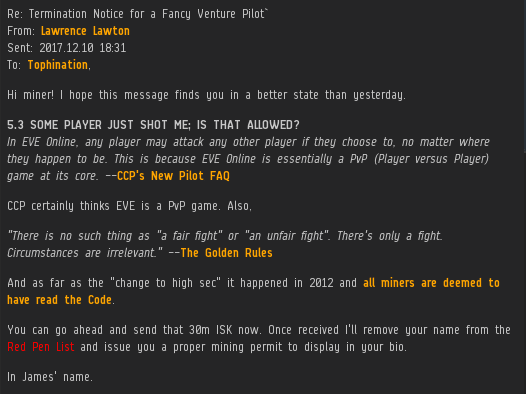 Thirty million isk for proof that EVE is a PvP game? 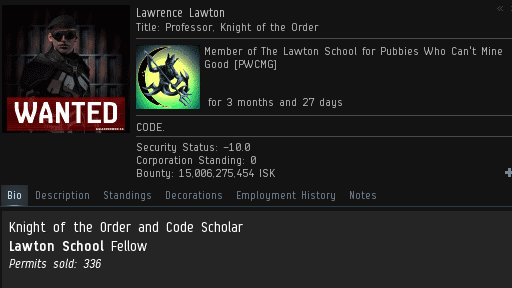 Lawrence Lawton is a Code scholar and a senior fellow at the prestigious Lawton School for Pubbies Who Can't Mine Good. 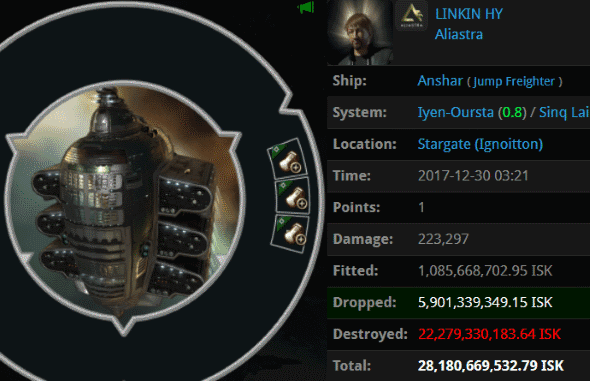 He has sold over 3 billion isk worth of mining permits. Yeah, he was willing to accept the wager. Our Agent didn't ascend to the apex of academia by accident. He knows his stuff. And with the complete and undeniable obliteration of the miner's argument, only one question remained. 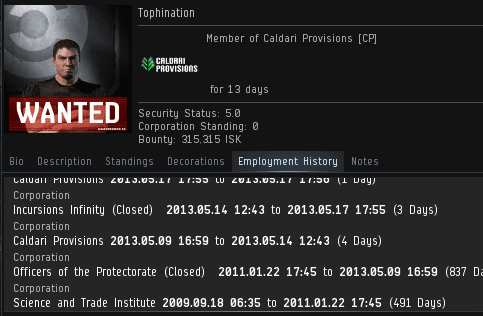 Would Tophination keep his word and hand over 30 million isk? Actually, yes. Yes he would. It was never a fair fight. Agent Lawrence had the miner outgunned, in every way, from the very beginning. In one sense, though, there was plenty of fairness: The Code is available to everyone. 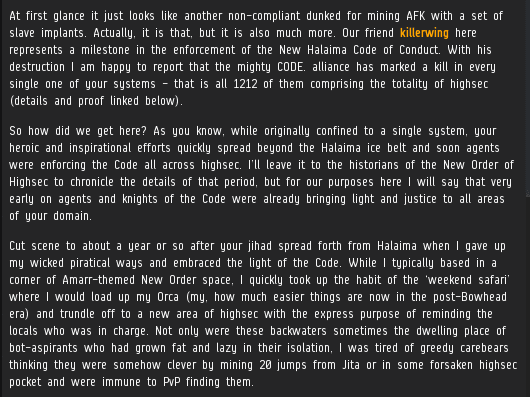 Ultimately, everyone in highsec will obey the Code. If you wonder how such a thing is possible, simply consider interactions like the one between Lawrence and Tophination. The good guys are winning. 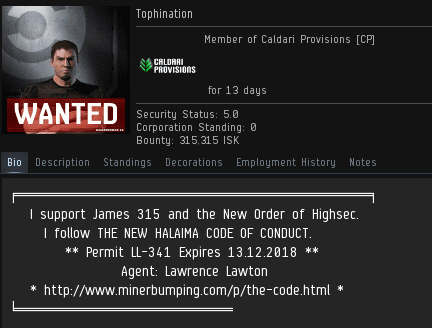 Previously, on MinerBumping... Mission Ready Mining corp was horrified by the return of Agent Kalorned, the notorious bumper who had started the nightmare that they were all living in. Kalorned soon discovered that things had changed since he'd last visited Gelhan. The "Term 16 Movement", dedicated to filing petitions against bumpers, had captured the imagination of Gelhan minerdom. Of course, Kalorned wasn't limited to bumping; he had plenty of gank alts to help keep the miners on their toes. Kalorned wanted everyone in Gelhan to know that he would enforce the Code using any method at his disposal. In the era of Term 16, any innocent comment could be seized on as an excuse to file another petition. The miners knew that militarily speaking, they were beaten. Their only hope was to pray for CCP's intervention. Paul Kirk was the latest to try his hand at the whole "rebel leader" thing. That meant, I suppose, that he would be the guy who would draft a petition on behalf of all the other Gelhan miners. It certainly didn't mean he would be leading any fleets. Another MRM firebrand, Patrick Bick, wanted to use violence. But Paul was more interested in compiling a case to send to CCP. For one thing, Kalorned was the purveyor of YouTube's largest collection of miner bumping videos. Realizing that he was getting nowhere, Paul logged off in disgust. Now it was up to Patrick. So far, Patrick wasn't ready to make good on his threats to gank Kalorned. Instead, he watched Kalorned closely, looking for patterns. Eventually, Patrick determined that Kalorned must be operating under some sort of 10-minute limit to bumping imposed by CCP. Time went on, life went on. A new generation of miners grew up under New Order rule. This new generation was intensely interested in the Saviour of Highsec, whose Code shaped their way of life. Older, more disgruntled miners, were frustrated to see newbies asking questions about the Saviour. Some still believed that if they ignored the New Order long enough, it would go away. But the New Order wouldn't go away. Not ever.